Here is another recipe inspired from of our local favorite restaurants, “The Cookery”, and is a nice diversion from your typical red sauce. I am not sure which part of Italy this dish heralds but it certainly isn’t something you’d find in your local pizza joint. I highly recommend using fresh pasta. Let me repeat that so it sinks in. I highly recommend using fresh pasta. Unfortunately today I was in too much of a rush to make the dough and let it relax for a few hours. With a photo assignment due and me wanting to photograph this dish using natural light, Barilla to the rescue! Everything came out great, but next time it’s back to the fresh stuff. The pic wasn’t bad either (at least to me and my photo instructor), and like clockwork I was rejected on foodgawker and tastespotting. Crap. We rarely have pork broth on hand and luckily there are a few gallons hanging around courtesy of July’s pig roast. If you are a little light on the pig juice you can use chicken broth (or even extra pasta cooking water in a pinch), just be sure to up the pancetta a little bit to get that nice piggy taste. In a large pan, saute pancetta, shallots and carrots. The pancetta should render up some fat to make it easier. When pasta is close to being done (very al dente), add the pork broth and peas to the pan. Mash up a few of the peas to thicken things up a little. Immediately after, strain the pasta and add to pan, reserving some of the water. Cook down pork broth until the pasta is perfectly al dente. If you run out of liquid you can add more broth or the reserved pasta liquid to loosen the sauce up. 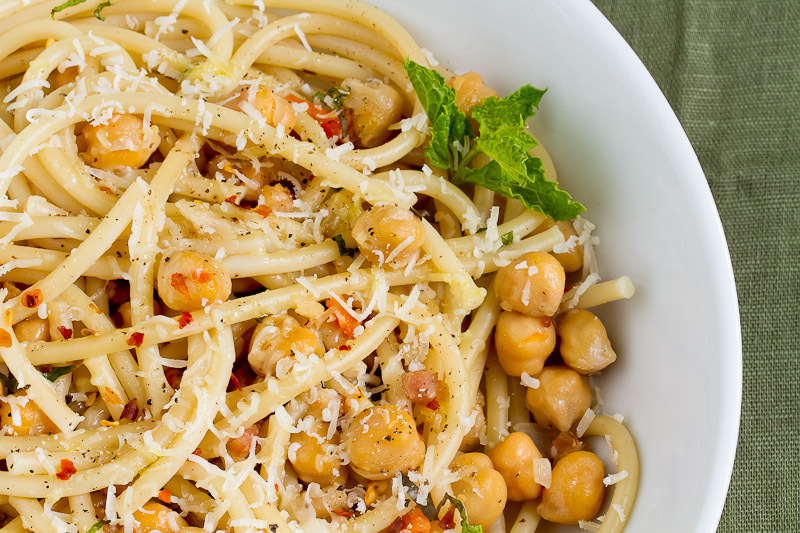 Serve with a drizzle of olive oil, grated cheese and some black pepper. This dish is pretty light, so I would go a little lighter with the wine, maybe a Pinot Noir? A Pino Noir, you say? I love chick peas. This sounds yummy. Panchetta and mint. YUM… Vanja would hate the mint. His taste buds simply need to mature. Good healthy food. YUM. Can’t wait to get home to cook. I am not a big mint fan, but it works well in this dish. I am sure it would be just as good with fresh basil, put enough pig in it and Vanja won’t be able to resist! 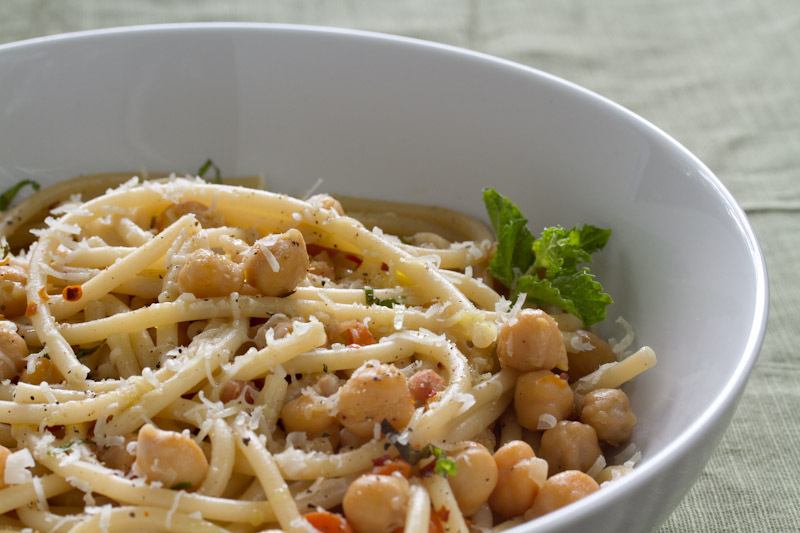 Chick peas, pancetta, mint, parmesan cheese, pig juice and fresh pasta (I know you did not have time to prepare fresh pasta for this dish, just saying) and a glass of wine….Damn this sounds good. I saw your link at Velva`s Blog and here I am. Congratulations on your awesome work. Thanks for dropping by, glad you enjoyed the site!